TSGE is a FULL save game editor. It can edit all parts of a save game file. Edit the player male / female flag. Edit the player hotbar locked flag. Edit the player hp and mana values. Edit the player hair style. Max all buff duration's to their known max values. Hack all buff duration's to int.Max value. Edit the player inventory entirely. Max all inventory slots to their max stack counts. Hack all stack counts to int.Max value. Edit the player equipment, vanity set, dye set, and accessories entirely. No restrictions to equip multiple accessories of the same type. Edit the player bank and safe entirely. Max all stacks to their max stack counts. Display info, credits, links, etc. for TSGE. What is TSGE coded with? TSGE is coded in C#. Link Removed - TSGE is no longer open source. TSGE uses .NET 4.0 to ensure it will run on Windows XP machines. It is designed, tested, and built using Visual Studio 2012 on Windows 7 Ultimate (x64). Austin Andrews - Titlebar icons. 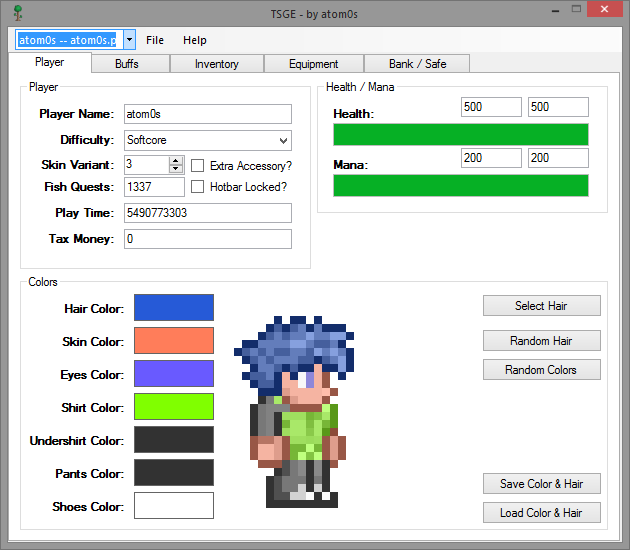 Terraria - Item textures and application icon. Sinzfeldt - For buying me Terraria. attilathedud - Original beta testing. http://imageshack.us/a/img707/788/5lbs.png - Bank / safe screen. Does the fact that you don't offer support to TSGE for free anymore mean you won't put out TSGE for Terraria 1.3? Or does it mean that if we want to download it when it does come out that we have to pay? Or, is it the third option, where I misunderstood your post, and you mean something completely different? And if it does cost money, then how much, and how will I get the download? P.S. I'm real sorry about this question, I know you hate getting these questions. Last edited by Zacknxs on Tue Jun 30, 2015 11:08 pm, edited 1 time in total. If/When I get to updating TSGE, it will be paid for. I will update this topic when that happens though. Well, that's unfortunate. Any clues as to pricing? And how would the files be sent? Email? And would I be entitled to any updates for TSGE? Zacknxs wrote: Well, that's unfortunate. Any clues as to pricing? And how would the files be sent? Email? And would I be entitled to any updates for TSGE? - Price is $25 to gain donation status on EliteMMO. - Files are downloaded from the forum. - Donations are one-time only. You will have access to the donation section for the life of the website. So you will have access to any updates. TSGE v2.4.0.0 is now released on EliteMMO Network. This version works with Terraria 1.3.0.x version(s) now! When I try to edit a character, I get the error, can you tell me if I did something wrong? System.IO.InvalidDataException: Game Version does not match the supported value! I apologize if this is an inconvenience. TSGE was updated to fix some issues with the ninja-update Terraria did last night. For future support though please post over on EliteMMO.